Normally I change parts around but I really don't see anything I would change. Price point is incredibly reasonable too. All business kind of bike. I would change the pedals at least. what would you run on it? Yeah, I saw the bike on SugarCayne. I ride Haro and will always be a fan but I'm not feeling this bike. I raced an RS2 in the late '80's. Group 1's are race bikes not trail bikes. My only issue with this bike is the lack of chrome parts. They are very nice, my favorite retro bike this year. YEah, the RS 1 is the old "RACE" model, I get that. Still, BITD we took our race bikes to the trails. M friend on his RS 1, another on his GT Pro Series and I on my Robinson. Those frames were later changed to a Limo, Mad Dog and a Holmes but they were the bikes we raced. My only issue with this is Haro was not making cranks like that in '78. I wonder is 13.75 is the center of the dropout or is it 13.5-14? That's a really good price for this complete. Could you post the video of the pro riding one on FB? 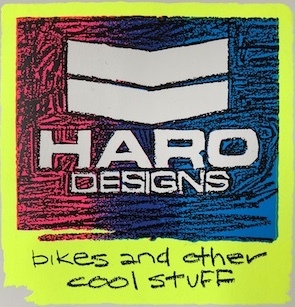 Haro Bmx posted it yesterday. I think it's pretty awesome. I don't need it but if I was buying a retro bike this week, I'd choose the Group 1. Yes sir, that's it. Thanks!